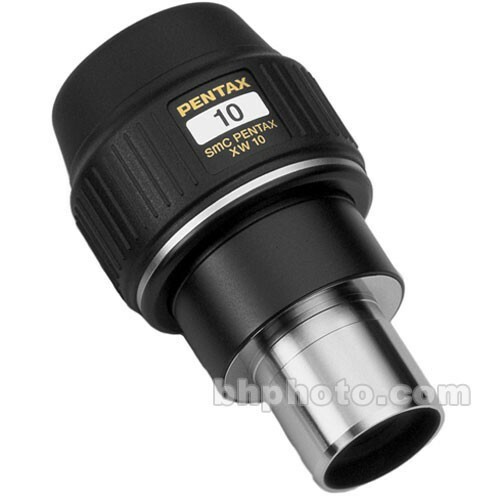 Featuring premium optical components, a wide field of a view, and generous eye relief for comfortable glassing, the Pentax SMC XW10 10mm Wide Angle Eyepiece is designed for use with Pentax 65mm, 80mm, and 100mm spotting scopes. The 70° field of view puts a wide segment of the horizon in front of you – even when wearing eyeglasses or sunglasses, thanks to the long 20mm eye relief. This eyepiece yields 62x magnification with the PF-100ED, 52x with the PF-80EDA, 50x with the PF-80ED, and 39x with the PF-65EDA II and PF-65ED II. Extra-low dispersion lanthanum glass elements provide a balanced image with minimal aberrations, while fully multi-coated air-to-glass surfaces and partially coated laminated surfaces avoid reflection for optimal light transmission. A light-shielding diaphragm further reduces internal reflections for a bright, high-contrast image. The eyepiece is constructed to Japanese Industrial Standard Class 4 for water resistance. It is not to be used underwater, but will easily withstand light rain or dew. Its diameter is the American standard of 1.25", so it can be used in other optics that accept eyepieces, and it offers a 43mm adapter mounting thread under the removable eyecup.